(Kingston, ON) As we age, our bodies begin to break down. Every day, something new falls apart and it gets harder and harder to feel comfortable or to be able to function as we once did. Even with our health care system, there are so many things we just can’t fix, so many extra expenses. Imagine what it must be like to be a dog suffering from numerous ulcers and a tumour in your bladder. Some of this is age related, some may tie back to a medication that had been administered. As a dog, there is no government health care program, no guarantee of any help at all. 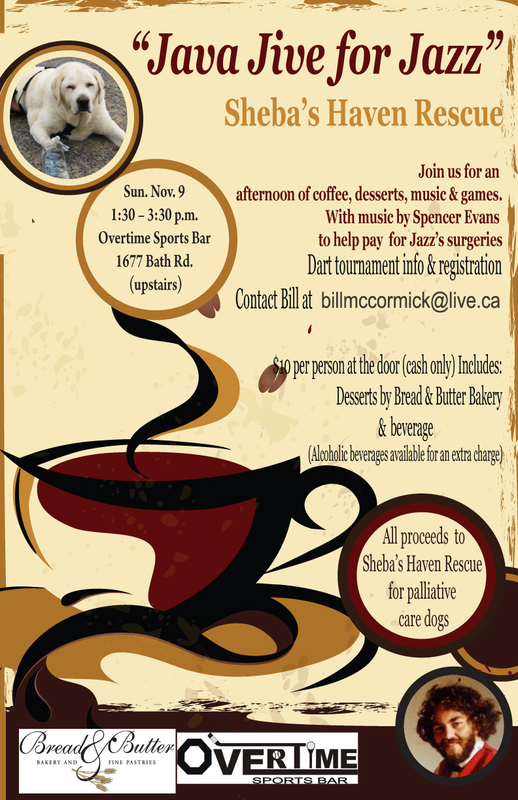 Sheba’s Haven is a special palliative care facility for dogs run by Pokrywa in Inverary, Ontario. An independent organization, they look after about 15 dogs who suffer from terminal conditions and for whom there would otherwise be no hope. Altogether, including his pre and post-surgery, the cost was approximately $8,000. To help offset these costs, Sheba’s Haven is holding a special darts tournament called Java Jive for Jazz on November 9 at the Overtime Sports Bar in Kingston at 1677 Bath Road (upstairs). Musical entertainment will be provided by Spencer Evans, and the event will feature games, prizes, a silent auction and raffles. Bread and Butter Bakeries will be doing desserts. All of this for a $10 donation. Everyone is welcome to participate. If you’ve never played darts but always wanted to learn, give it a try. It’s all in fun and all for a great cause. Check the attached poster for more details, or contact Bill at billmccormick@live.ca . This entry was posted in Animals, Announcements, Events, Sheba's Haven and tagged java jive for jazz, palliative care for dogs, Sheba's Haven by llpayette. Bookmark the permalink.